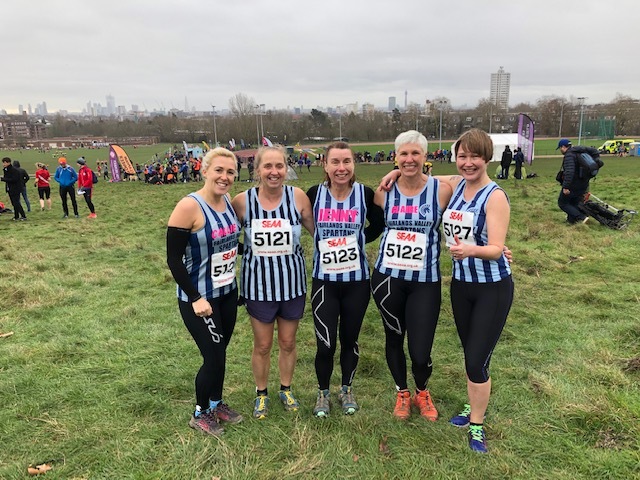 Fairlands Valley Spartans had a total of seven runners in Saturday’s South of England cross country championships on Parliament Hill Fields. The race starts with a tough climb and it carries on that way. The conditions were described as the driest for a very long time but the event still extremely challenging. 703 times were recorded in the women’s race which was over eight kilometres (about five miles). CLAIRE EMMERSON was 545th in 43:27; JENNY GARRETT 609th in 46:25; PETA WILSON 672nd in 51:32; SHARON CROWLEY 679th in 52:24 and CALLIE CHAPMAN 686th in 54:48. There was a very tough cut off time of 1 hour 30 minutes for the 15 kilometres (9.3 miles) men’s race. Spartan TIM ROBINSON got a shift on in the last kilometre overtaking others to finish with just 13 seconds to spare. Technically he was last of the 1147 finishers but in fact there were actually quite a few behind him. 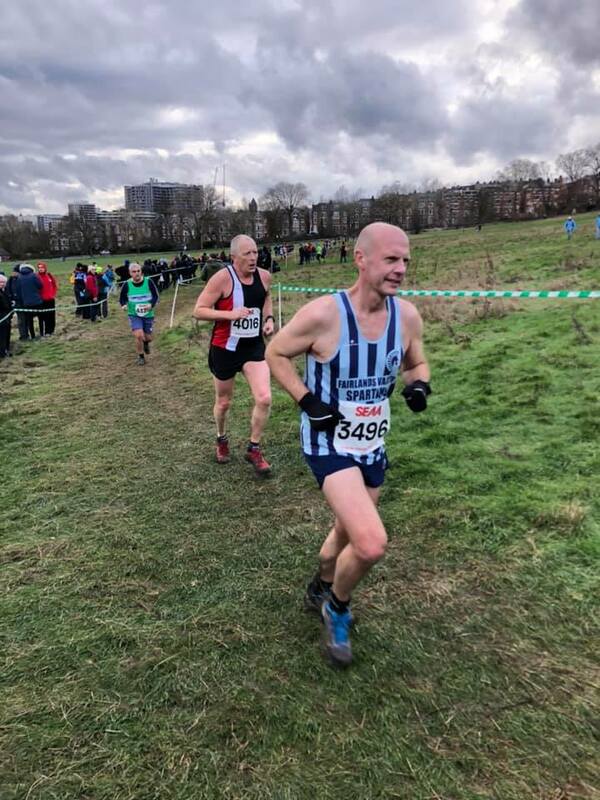 Beating a limit of well below 10 minutes per mile is an achievement in itself for such a hilly and usually muddy event. TOM SAUKA was 1,002nd in 1:11:14. ROGER BIGGS completed his USA race trilogy at the Callaway Gardens Marathon in Pine Mountain, Georgia, USA on Saturday. The marathon was held entirely within the Callaway Gardens. It was two laps amongst lovely scrubland and many lakes. The race started at 08:00hrs, with an air temperature of around -3C, only warming to around 7C in mid afternoon. Roger started the race with a hat; cap; two pairs of gloves; two long sleeve T-shirts; one T-shirt and one running vest!! He was past 19 miles before he started the shed things. With his usual consistent manner, Roger finished with a time of 5:40:50, to be third in the 70+ category, winning another trophy to take home. The Lee Valley Velodrome Ten consists of ten laps of an undulating ten mile loop around the Olympic Velodrome Park. ANN TRYSSESOONE finished first in her age group with 1 hour 27 minutes 10 seconds. Spartan CATHY CRAIG was third in her category in the EDP Seville Half Marathon with a gun time of 2:18:11 and a watch time of 2:12:53. January maybe but it was a lovely day in Hyde Park for the Last Friday of the Month 5K round the Serpentine. JIM BROWN ran a year’s best 24 minutes 48 seconds and moved up to second in his age category. It was mild, dry and with a slight breeze for the lunch time race. Jim was 217th out of the 266 finishers. Runner numbers remained high at Stevenage Parkrun with 377 runners. Martin Blackburn was ninth and first Spartan man in 19.11. Anton McCalla ran a parkrun PB of 28:08 on his third parkrun. Caren Dowsett was also running her third parkrun and achieved a new PB of 44:47. Congratulations to David Pattman running his 50th parkrun in 25:36 (48 of those runs were at Stevenage). Marie Colucci was second woman at Stevenage in 22:35. Barry Osborne ran a new parkrun PB of 26:20 at Westmill on his 49th parkrun. Nicola Hatherley also ran there for the first time in 36:50. Andy Jay and Steve Smithson joined 384 others at Panshanger with Steve clocking a time of 23:25 and Andy 24:55. Darryl Stevens ran for the first time at Dartford Heath in his 106th parkrun overall. His time was 37:43. It was Letchworth parkrun’s first birthday and the course was run in reverse. Madeline Pritchard was sixth lady in a time of 25:41. James McSweeney was in Littleport near Ely on occasion of his 51st parkrun and ran a new PB (personal best) of 22:49. Full Spartan parkrun results can be found at the end of this release. Fairlands Valley Spartans are into week four of their marathon training plan. Are you running a Spring marathon? Whether you want to get round and enjoy; are a first timer; want a personal best or expect to go “Sub Three” the Spartans are the local club for you, there are group training opportunities five days a week. Have a look at www.fvspartans.org.uk or the club’s Facebook page. Full Spartan results are listed below.